With the growing impacts of climate changes there is a rising demand for solutions to protect low-lying, inhabited areas. Wintec has developed AquaBlokk, a new sluice system that consists of building blocks ready to be lowered into the water when arriving onsite. 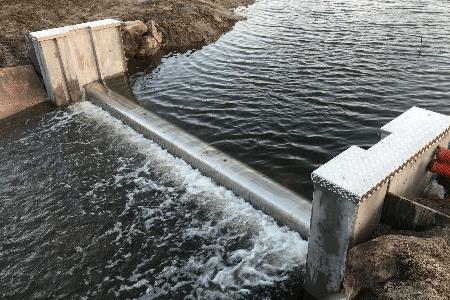 This way, a new sluice can be ready in 48 hours. “With more extreme weather followed by e.g. flooding, we have to invent innovative solutions to protect the citizens living in low-lying areas. If we neglect to solve these problems, then eventually people will have to abandon their homes,” says Oliver Bach, CEO at Wintec – a Danish supplier of solutions for e.g. climate protection. The typical duration for building a sluice is minimum six weeks, because you need a contractor to prepare the underground, a carpenter to build the mould, a concrete company to cast the sluice and then a technician to install the sluice, the control panel, activators, pumps etc. “We have finished complete projects within 48 hours, because we arrive onsite with the prebuilt block where sluice, pumps, motors etc. are already built in. With AquaBlokk, everything is ready to be lowered into the building pit,” Oliver Bach says. “This is also much more cost efficient because the customer only needs two suppliers for the entire project; Wintec and a contractor for preparing the building site if necessary,” Oliver Bach continues. After installation, the system is ready for operation. The control system can be connected to the internet and operators can use a computer, a tablet or a smartphone to control water flow and regulation of the sluice gate. Wintec will be exhibiting at the Pavilion of Denmark at Aquatech 2017. Meet them at stand number 07.401B. Specialises in e.g. water and climate protection solutions. For more information, visit www.aquablokk.com.